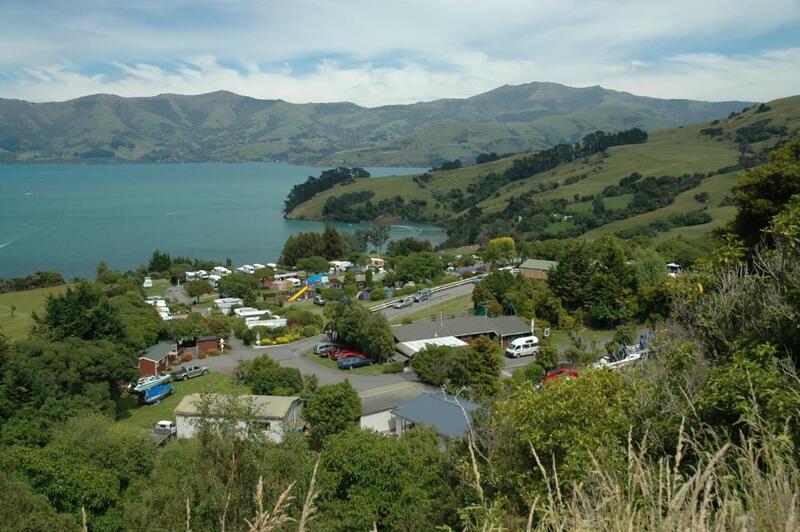 Lock in a great price for Akaroa Top 10 Holiday Park – rated 8.5 by recent guests! Best option for us for an overnight stay. Cabin with a view over Akaroa was a bonus. Facilities good. I didn't have a good stay. But what I liked could, at best, be the location near the little lake. good location, clean room. just enough for a short stay. Cabin to share bathroom and kitchen is a bit small as compared with Oamaru Top 10 Holiday Park with similar price. Family friendly environment. Nice comfy bed with nice linen. Clean compact space for family of 3. Good shower. The location is good but a routemarch to get down to the village. The advertising for the motel/cabin showed a lovely sea view but the trees now obstruct the view which is disappointing. More advertising for the Top 10 should be added to the Main Road so you know which camping ground you are heading to. The unit we had was definitely not soundproof! Great setting overlooking the water and mountains. Very quiet. Great views. Cabin was spacious and comfortable. Clean. Provides accomodation at a cheaper rate than other Akaroa properties. Helpful staff. 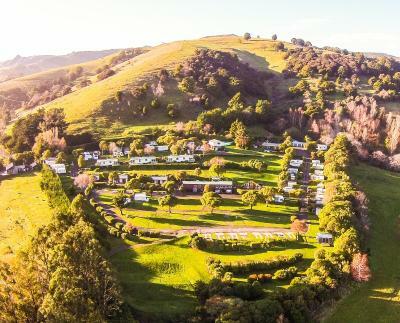 Akaroa Top 10 Holiday Park This rating is a reflection of how the property compares to the industry standard when it comes to price, facilities and services available. It's based on a self-evaluation by the property. Use this rating to help choose your stay! Akaroa Top 10 Holiday Park offers accommodations in Akaroa. Christchurch is 25 mi from the property. Some units also have a kitchenette, fitted with a microwave. A shared bathroom is provided. Akaroa Top 10 Holiday Park also includes a seasonal outdoor pool. You can play table tennis at the property. Lincon is 43 mi from Akaroa Top 10 Holiday Park. The nearest airport is Christchurch Airport, 53 mi from the property. 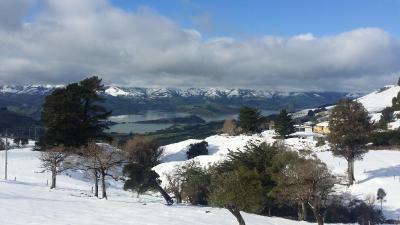 When would you like to stay at Akaroa Top 10 Holiday Park? This self-contained studio has stunning harbor views. It also includes a fully equipped kitchen with a microwave. A modern bathroom, TV, bedding, electric blankets and towels are provided. This room features lovely harbor views. It also includes a double-sized beds, electric blanket and a fully equipped kitchen with a microwave. A TV, bathroom, bed blankets, towels and a separate bedroom with bunk beds are provided. Please note that this room does not have cooking or eating utensils. These can be hired from the office for NZD 6 per person, or you can bring your own. This room includes a double-sized bed, 1 bunk bed, a flat-screen TV, an electric jug and a refrigerator. It also includes access to shared bathroom and kitchen facilities, located opposite the room. A mattress protector, fitted sheet, pillows and pillowcases are provided. Please note that cutlery and cooking utensils are not included in the price. You can rent them at the property for NZD 6 per person or bring your own. At the head of Akaroa Harbour, overlooking the picturesque seaside village, beaches and bays, Akaroa TOP 10 Holiday Park has one of the most outstanding locations in New Zealand. Situated within walking distance of the French inspired Akaroa village and away from the traffic, Akaroa TOP 10 is the perfect place for a quiet, affordable getaway for couples and families. WiFi is available in public areas and costs NZD 7 per 24 hours. House Rules Akaroa Top 10 Holiday Park takes special requests – add in the next step! Up to three children under 12 years are charged NZD 14 per night when using existing beds. Akaroa Top 10 Holiday Park accepts these cards and reserves the right to temporarily hold an amount prior to arrival. Please note that for the Standard Cabin, cutlery, blankets and towels are not included in the price. You can rent them at the property for $7 per person or bring your own. Please note that guests can hire blankets for $5 per bed. Kitchen on the small side for the size of camp. At the time of our visit was also a bit short on bits and pieces (pots, pans, utensils). Location fantastic, room great, whole site well looked after. Good clean rooms. 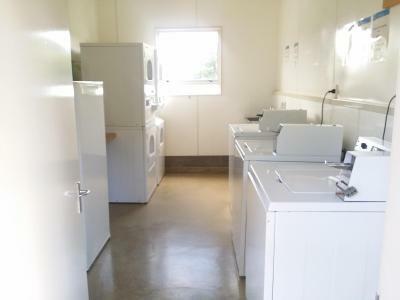 Clean toilet and shower block. Good views. Town was close, but a steep gravel track through the bush. The fact that we could hear our neighbours talking and the bed in the adjoining unit was up against the wall of our unit. No storage in the bathroom area at all. The heating was a little inadequate for the cooler temperatures. Location and view were good. Privacy was good. The GPS takes you the top of Morgan’s Rd which turns out to be a very steep metal road once you get into it and your unable to u turn especially on a big Harley Davidson M/C. It was a very dangerous situation for me and very lucky the bike stayed upright. It needs a sign saying enter via Old Coach Rd which is a sealed Rd heading into the Top 10. Apparently the council has to put the sign up.? ?